Kombucha is a beverage that is derived from the fermentation of yeast and bacteria. It has been lauded for its distinctive, sour vinegary taste and potential, though undocumented, health benefits. When brewing Kombucha, care should be taken to ensure that the resulting product complies with health and safety standards. Basic safety should be observed when drinking Kombucha, including checking the expiration date of the beverage and looking for unusual colors and smells before drinking. Kombucha is comprised of relatively simple ingredients: tea (usually black), sugar and probiotic bacteria and yeast. As the Kombucha ferments, the pH levels drop, from around 7 to between 2.5 and 3. If the Kombucha is underfermented, it may become a site for pathogens and not develop the proper nutrients. If the Kombucha is overfermented, it can strain the stomach's ability to digest it. To ensure that your Kombucha has been properly brewed, check the pH with a simple pH testing strip before drinking. Kombucha should never be brewed or stored in ceramic, metal or plastic containers, as the toxins in those materials can leech into the liquid. Kombucha is at risk for a number of potential infestations during the brewing process. Mold can attack the fermenting Kombucha, showing up as small circles of white or green fuzz on the surface of the liquid. Airborne bacteria and yeast can compromise the Kombucha "mushroom," causing it to appear thin and flaky or disappear entirely. A rotten egg or cooked cabbage smell is indicative of a Kombucha brew that's been compromised by unwanted bacteria. Kombucha should not be consumed by women who are pregnant or nursing, or by children who are younger than four years old. When drinking Kombucha, always check the expiration date on the bottle if it was commercially purchased. In general, you should not consume more than four ounces of Kombucha daily. If you are drinking Kombucha for the first time, start with a small quantity and see how your body reacts before drinking more. Because Kombucha can have a detoxifying effect on the body, it should be accompanied by plenty of water. Drinking too much Kombucha, or drinking Kombucha that has not be properly brewed, can strain your body's ability to digest it safely, putting undue stress on your liver and causing potential upset stomach, nausea or liver complications. Due to the fermentation process, Kombucha does contain a small percentage of alcohol -- generally under the legal .05 percent limit. However, in some cases Kombucha has been known to ferment further after the bottling process, bringing the alcohol content up to 3 percent, which is as high as some beers. 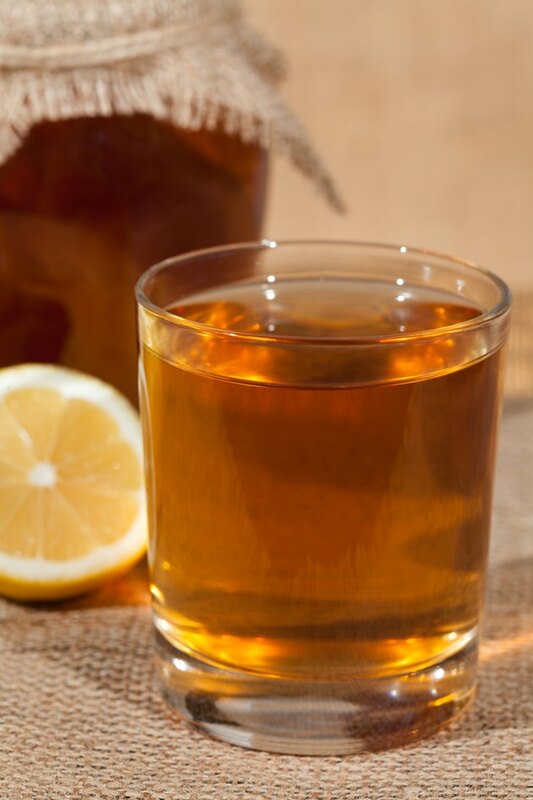 Many people experience a "buzz" after drinking Kombucha, which can be attributed to the caffeine in the black tea that the Kombucha is brewed in.